7.9 Mag Quake in Alaska. A tsunami alert has been issued for the entire U.S. west coast following an earthquake striking off southern Alaska. 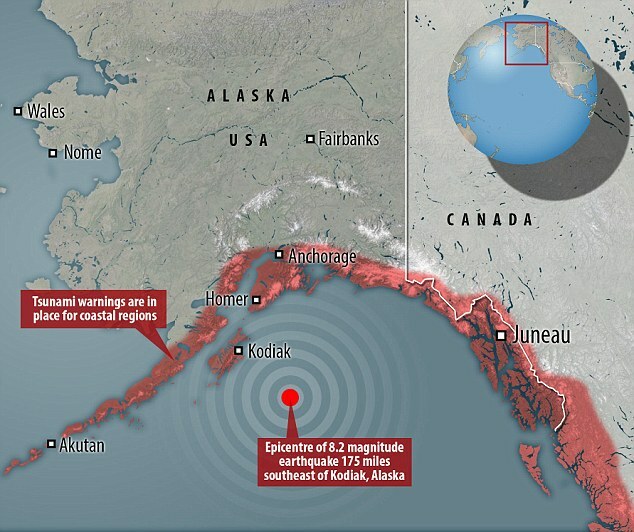 The 8.2 magnitude earthquake struck 157miles (256km) southeast of Chiniak, Alaska, at a depth of 6.2miles (10km) at 9.31am GMT on Tuesday, the U.S. Geological Survey said. Authorities in Alaska and Canada's British Columbia have told people living in the coastal areas to evacuate homes and businesses and move to higher ground. They will be lucky to even notice it over in Hawaii, let alone Fiji or NZ.. If it were off somewhere like Guam or Fiji or Indonesia we might feel it down here. The effect has been negligible to non-existent. However, it had NOAA going there for a bit.